I wanted to give Summer Palace a glowing review one…but eh, I read HGW and Summer Palace gave a free meal to food critics but never give me!!! I am #22 reviewer on HGW leh and never invite me!!!! See me ah beng is it?! Neh mind. That day, I saw Chef Liu Ching Hai on TV, I was so excited because he is the mastermind behind Summer Palace. I love the luxurious decor of Summer Palace. It is huge and spacious and thoughtful. The restaurant makes the wooden Chinese chairs comfortable by adding a cushion to support the back. You can book the private room accommodating 12 to 40 people but there is a minimum spending of $800 – $1000 I think. How do I know this? Because the very courteous and polite China waitress, Tinnie, told me. Her service is immaculate, friendly and respectful. She is one of the best servers I have come across lately. I love it that they put the teapot on a ledge away from our table because this is how good service is, that they would refill our tea. The service is a WIN. We had the 4th-person-eats-for-free OUB deal. But we could only pick the tasting menu and not the other set menus. $62 per person but $62x3persons/4persons=$46.50++ worth it! I would be so, so incensed if this were the appetizer. So small! But heng lah, it was a freebie. I ah beng, love freebies. Something like an amuse-bouche, you know, the appetizer before appetizer to clear your palate. But I always say, amuse-bouches are food leftover from yesterday’s food. I didn’t know Chinese restaurants have amuse-bouches also..but aiya free one, better eat. The waitress who served us the food said this dish very quickly, so when the head waitress came along, we asked her. She told us it is just gingered roasted chicken. And offered us another round each! YES! TAN TEO! Nothing special about this, but aiya, it’s free! Free two times somemore! 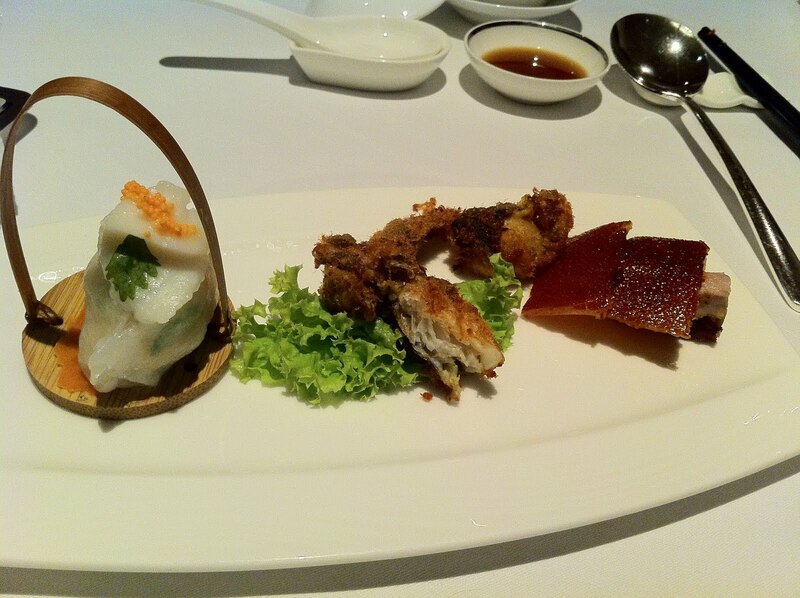 Appetizers from left to right: har gao (prawn dumpling), soft-shell crab and suckling pig. Instead of prawn in the dumpling, there was scallop. I love the sweetness of scallop in general. And I haven’t tasted suckling pig in the longest time. The crab was unique and original in that immediately after frying, the chef rolled it over pork floss. So if you eat the dish from left to right, there was a continuity, seafood to seafood+pork to pork. Everything tasted quite perfect but the food could be hotter. 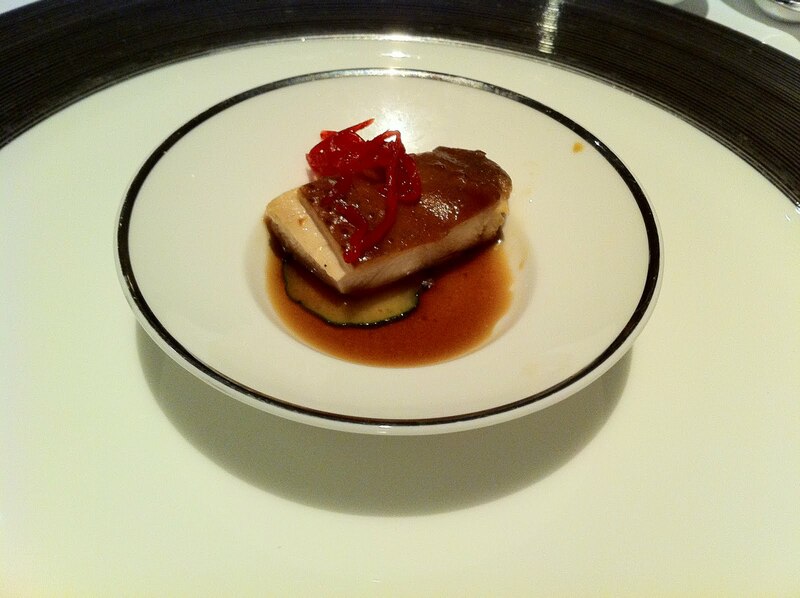 I also think the sweetness from the pork floss clashed with the sweetness of suckling pig…but I am being picky here! Sharks Fin, Fish Maw soup. WOW. look at the size of the fin and the generous ingredients. Innocent sharks bled to death for this bowl and the bowl was huge too. Worth it! I better finished it all. 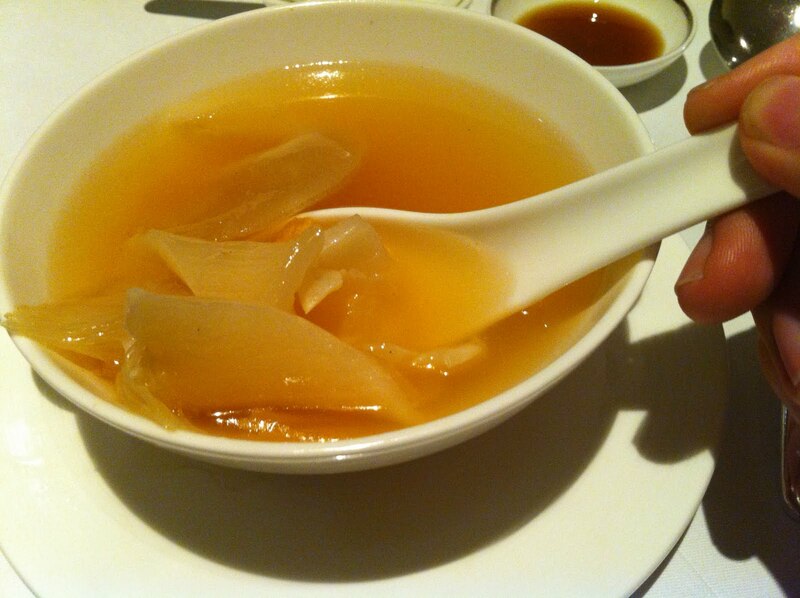 This shark fins soup, as you can see from the photo, is different. Not the starchy kind, clear broth. Mixed review for this soup. Some of us still prefer the starchy kind–old habits die hard–but I love it. It was light and refreshing and I could actually see the sharks fin I was eating. I don’t mind changes. Wasabi prawn is not on the tasting menu and we ordered this because it is supposed to be the specialty. Not worth the money. $38 for 8 prawns!!! and 2 prawns per person. $38 is half the price of a set meal here! If I were to super fussy and irritating, I would be pick at the service at this time because we hadn’t finished our soup and they already served us our prawns. So by the time we ate our prawns, they were already cold. But still marvelous. The wasabi was just the right amount and wouldn’t produce the tearing, choking feeling, but the taste of it was still strong. 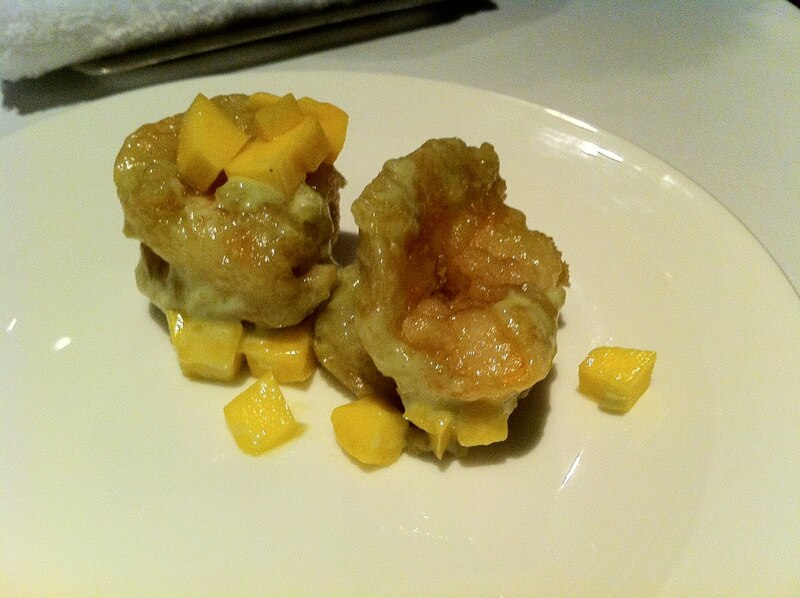 The slight bitterness of the wasabi was counteracted by the sweetness and very-little-bit-of sourness of the mango and all these flavors added to the springy, supple texture of the prawns. 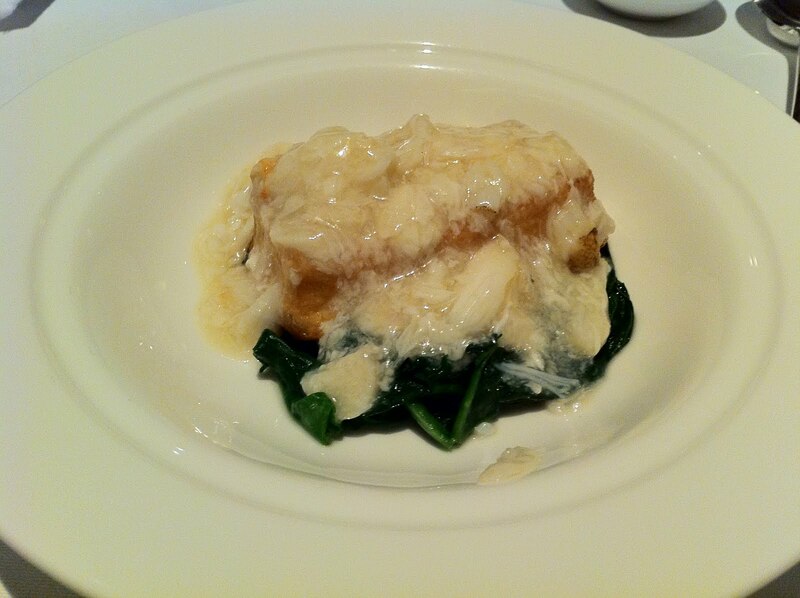 Fried tofu with spinach and crabmeat sauce. I hate to eat tofu because it has no taste. And do you know tofu makes you retain fats? It’s because soy bean has estrogen, and estrogen helps store fats, so those who need to lose the last 3kg should never, never eat soy products. But this dish was very great despite my prejudice. The tofu actually had taste. The crispy cover tasted very yummy, a bit like lard, contrasting with the plain and soft inside. The spinach was a little over-cooked and soggy but still ok. There was actually visible crab meat in the sauce! This is the favorite dish among my friends. Oven-bake teriyaki salmon. It was very innovative to deep fry the lotus root until it was as crispy as potato chip. I have never seen this before, and it tasted damn yummy. Someone should patent this and market it as a snack. I bet the salmon had been washed with hot oil first before it was baked because the outside was crispy and inside soft. 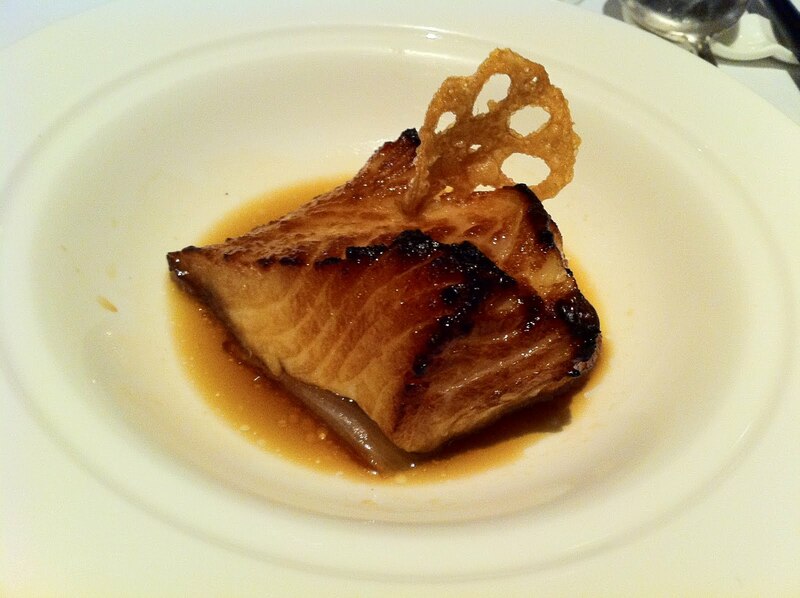 The slightly charred tips of the salmon were so yummy that I didn’t mind it was char ta. The juice from the salmon and teriyaki was tasty and the combination of green onions with salmon was ingenious! I always thought salmon is an angmoh dish, but the green onions really made it taste more Chinese. Win. 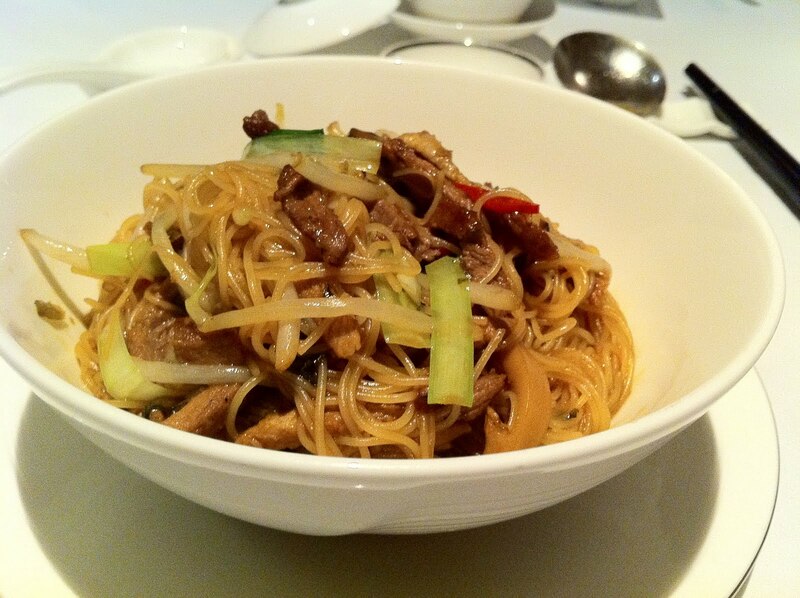 The wet fried noodles with duck was very wonderful. It had the taste of wok (which is a mark of all good fried rice and noodles), the superior broth made the noodles very, very sweet. Big serving too. 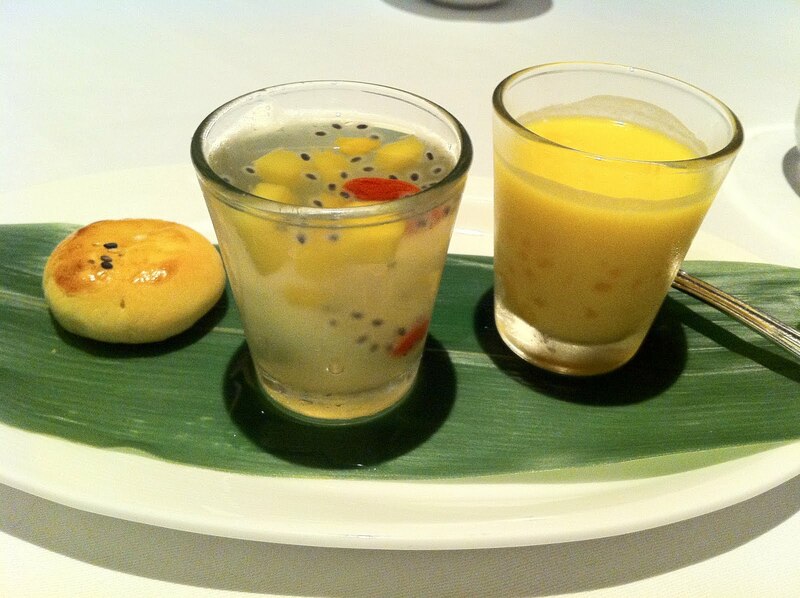 Desserts: Tau Sar Bi’ah; fruit pudding; mango pudding. Very average but since I didn’t come here for desserts, I shouldn’t complain. Overall, the ambience was first-class; the service was first-class; and the food was first-class. And considering the number of dishes we ate, and considering that Chinese restaurants are expensive, I thought it is very worth the money (except for the prawns). Highly recommended.